Comb-footed spiders are any of the species of spiders belonging to the taxonomic family Theridiidae. Their common name is a reference to their fourth pair of legs that have combs or serrated setae, but they are also known as or cobweb spiders. Only a couple of these spiders have venom that is toxic to humans. This family is known by the fact that the females eat the males after fertilization of the eggs. The family Theridiidae is the most diverse family of spiders, not only by appearance, but also behavior, ecology, and morphology, which means they can be found just about anywhere. Theridiidae spiders perform sexual reproduction. These spiders have a polyandrous mating system. The male carefully approaches the female, because she may be up to 30 times heavier than the male, and there is a possibility that she will eat him. The female then lays the eggs on her web, and protects them until they hatch. Once hatched, the baby spiders of some species are fed by their mother until they can find food on their own. This characteristic distinguished the Theridiidae from other spiders because they are the only ones that feed their young..The spiders in the family Theridiidae go through incomplete metamorphosis. 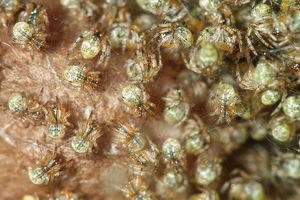 When they hatch from the eggs, the young spiders resemble a miniature version of the adult (nymph). Throughout their life, the spiders change colors by shedding their exoskeletons. This also allows the spiders to grow. Unlike the female who can live up to three years, the male can only live up to one year. One of the most known spiders of this family is the Black Widow spider. These spiders have quite a few differences in their life cycle compared to the other species in Theridiidae. Their egg sac is brown in color and can contain anywhere from 25-900+ eggs. The incubation period of these spiders is 20 days. Unlike most of the other spiders in the family, the Black Widow has a monogamous mating system. Both the male and female reach reproductive maturity at 70-90 days old. The male weaves a sperm web, that he later places spermathecal openings of the female with his papal organs. Before all this happens, the male must make sure that this female is of the same species. He comes up to the female and vibrates her snares' threads. The eggs have a gestation period of 8-30 days. After they hatch, the young spiders disperse and leave the web. The mother dies shortly after. These spiders live just about anywhere: trees. the ground, cave, houses, etc. They inhabit any place where they can build their webs. Those places are usually dark and sheltered. They live in tropical, temperate, and terrestrial habitats and inhabit the terrestrial biomes of desert or dune, rain forest, chaparral, taiga, forest, scrub forest, and mountains. All the spiders are insectivorous. 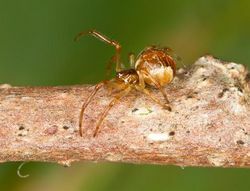 Unlike other spiders, the Theridiidae spiders use a sticky silk to catch their prey. Once caught, sometimes even before, the spider bites their prey, injecting it with their venom, killing it quickly. These spiders have quite a few predators. 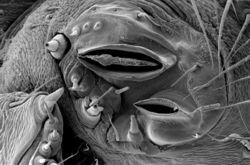 They include Formicidae, Hymenoptera, other Araneae, praying mantids, Aves, small Squamata, Amphibia, and small mammals especially Soricidae. Some of the spiders have camouflage to hide from their predators. Others build hiding places into their webs. The poisonous spiders will bite their predator if their warning coloration did not scare them off. 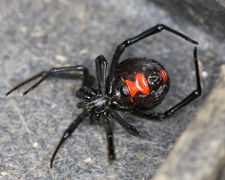 The Black Widow is the most known spider in the family Theridiidae. It is considered one of the most toxic spiders in the world. Mostly everyone who knows of this spider fears it because of its venom. Its venom is 15 times worse than that of a rattlesnake. That is because it contains an extreme neurotoxin called latrotoxin. Symptoms of a bite include severe back and arm pain, elevated blood pressure and heart rate, weakness and shakiness, nausea or vomiting, fainting, dizziness, abdominal pain, chest pain, breathing problems, and muscle cramps and pain. Alpha latrotoxin targets the central nervous system. It then modifies the design and behavior of the nerve terminals. It also damages the communication between the nerves and muscles, making muscle control difficult. Since it usually takes a couple hours for the neurotoxin to start working, it is frequently easy to get medical attention before the latrotoxin begins to take effect. Rarely does someone die or have permanent damage from the venom if they are quick to get medical help. This is a video of the unique mating rituals of the Black Widow Spider. ↑ Theridiidae Wikispecies. Web. Last modified May 17 2013. Author Unknown. ↑ 2.0 2.1 2.2 Theridiidae Encyclopedia of Life. Web. Last-update June 15, 2103. Author Unknown. ↑ THERIDIIDAE Theridiids Arachne.org.au. Web. Date accessed December 17, 2013. Author Unknown. ↑ Newton, Blake.COBWEB SPIDERS University of Kentucky Entomology. Web. Last-update May 09, 2011. ↑ Black Widow Spider, Lactrodectus mactans Entomology and Plant Pathology . Web. Date Accessed January 13, 2014. Author Unknown. ↑ Latrodectus mactans- Reproduction Encyclopedia of Life. Web. Last-update May 8, 2012. Author Unknown. ↑ Black Widow Spider National Geographic. Web. Date Accessed January 13, 2014. Author Unknown. ↑ Vigil, Sandy. What Is the Neurotoxin in the Black Widow? Paw Nation. Web. Date Accessed January 13, 2014. This page was last modified on 20 January 2016, at 15:15.